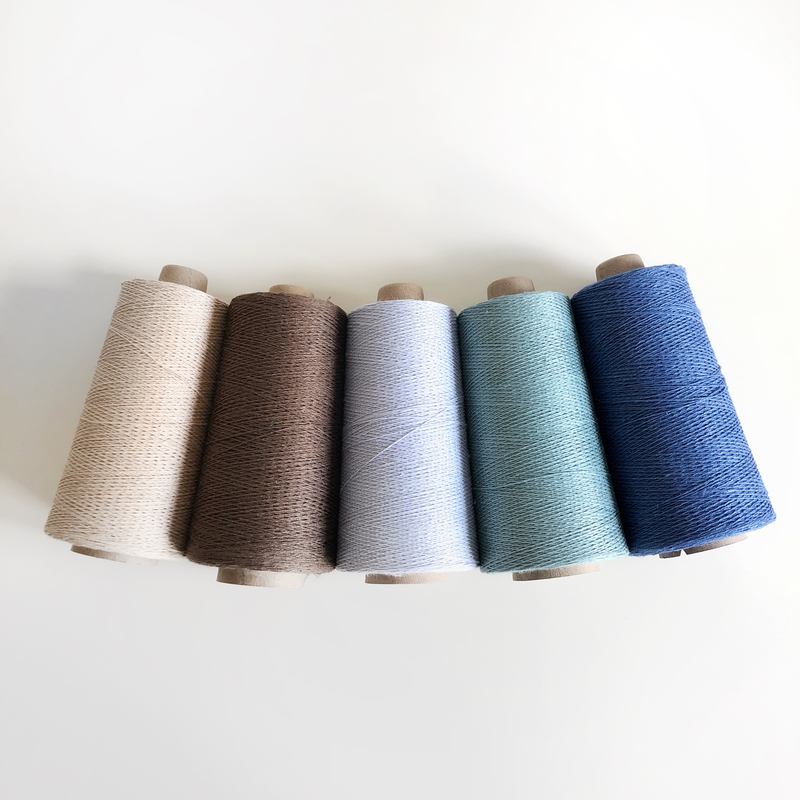 If you only have time to fit one last project in this summer, let it be linen! 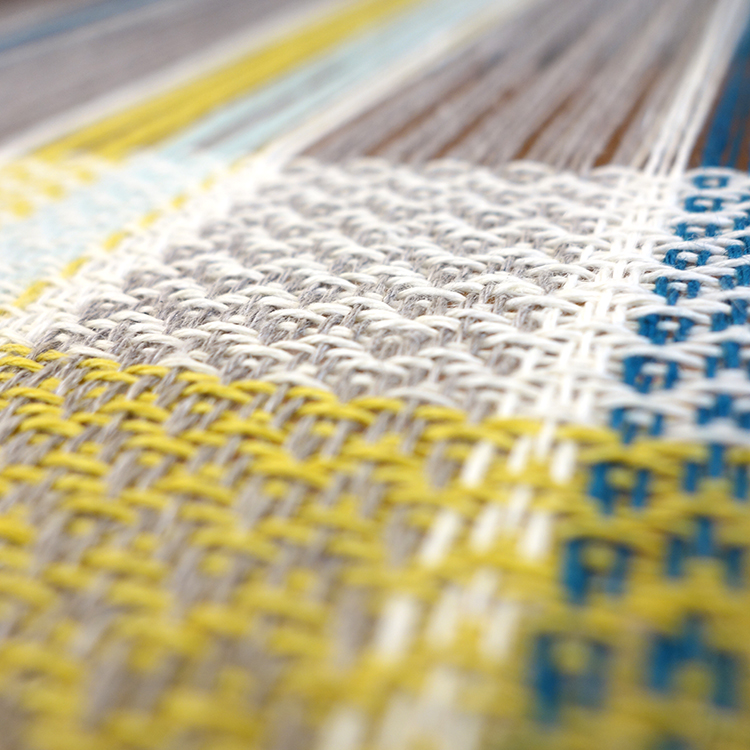 Linen sometimes gets a bad rep for being tricky or only for experienced weavers (not true!) but weaving with it in hot, humid temperatures can make the learning curve even easier. 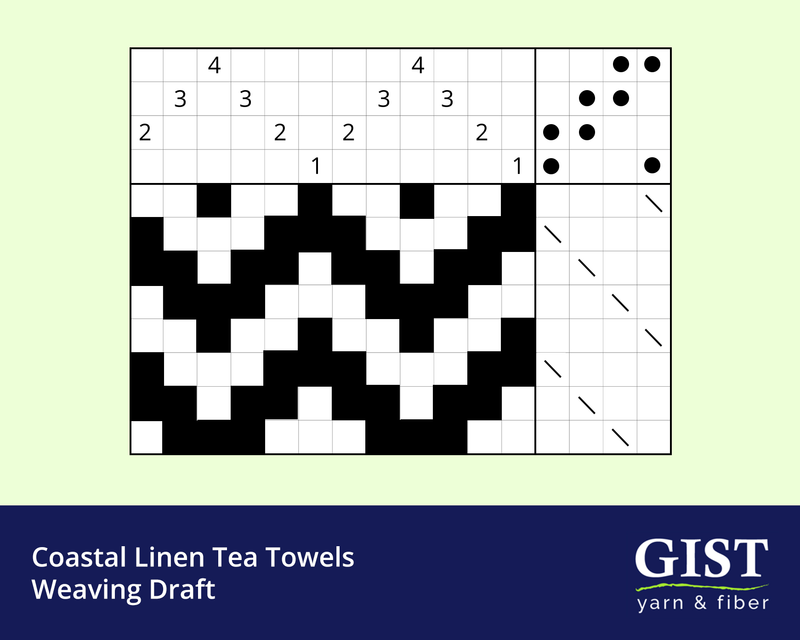 (See more tips below for weaving with linen). 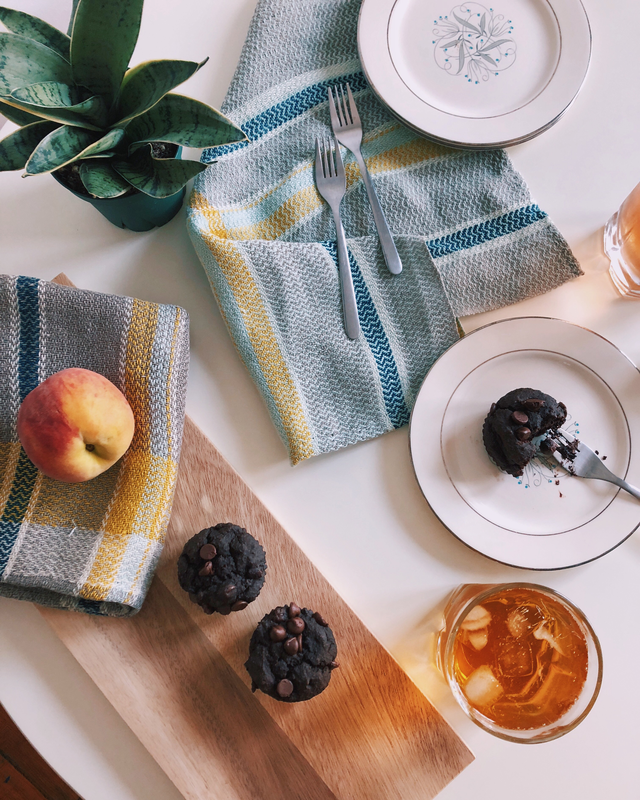 I designed these tea towels with our gorgeous 100% linen yarn imported from a textile mill in Lithuania. I chose three subtle colors (Fog, Cream and Sea Glass) and two bright pops of color (Peacock and Goldenrod). I encourage you to experiment with your own color choices, mixing some bright colors with some neutrals. You can also see our kits below for some more suggested colorways! Warp: Five ½ lb. cones of 100% linen - Color A (Fog), Color B (Cream), Color C (Peacock), Color D (Goldenrod), Color E (Sea Glass) See other suggested color combinations below or choose your own! 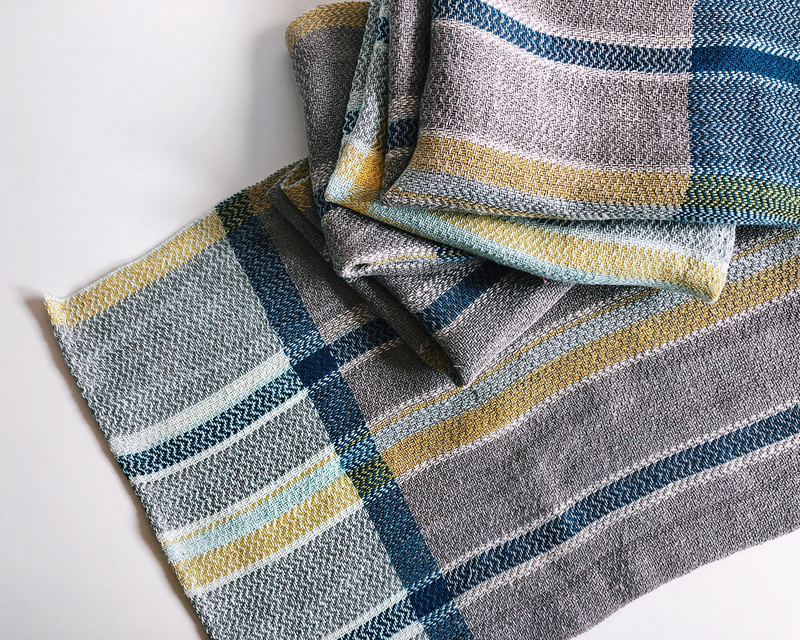 Care Instructions: Linen gets softer and even more lovely with wash and use. 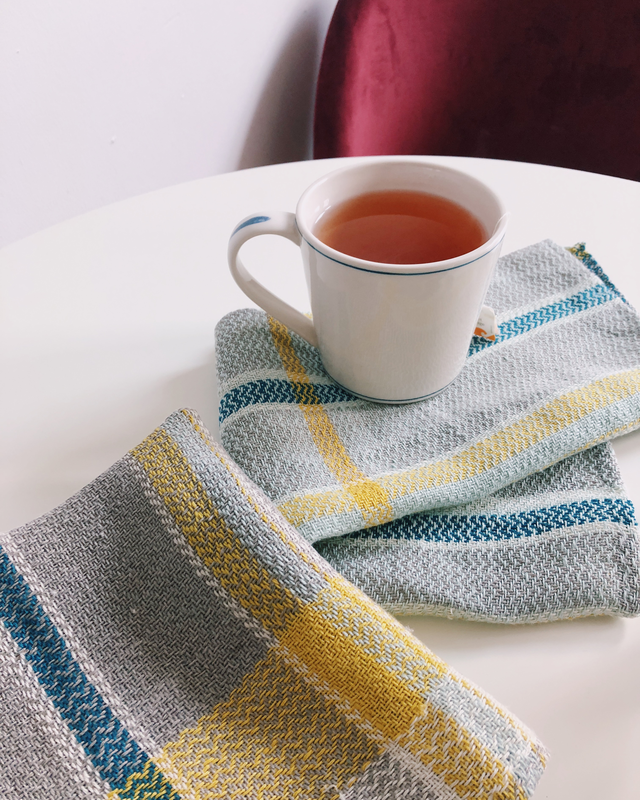 You can machine wash and tumble dry, but if your towels get regular use, using the dryer can shorter their life span (all textiles last longer if they don't go in the dryer - the lint in your dryer is bits of the textile coming off). You can also handwash and hang on a line to dry. Either way...if you plan on ironing, you can iron while they are still slightly damp for the best results! 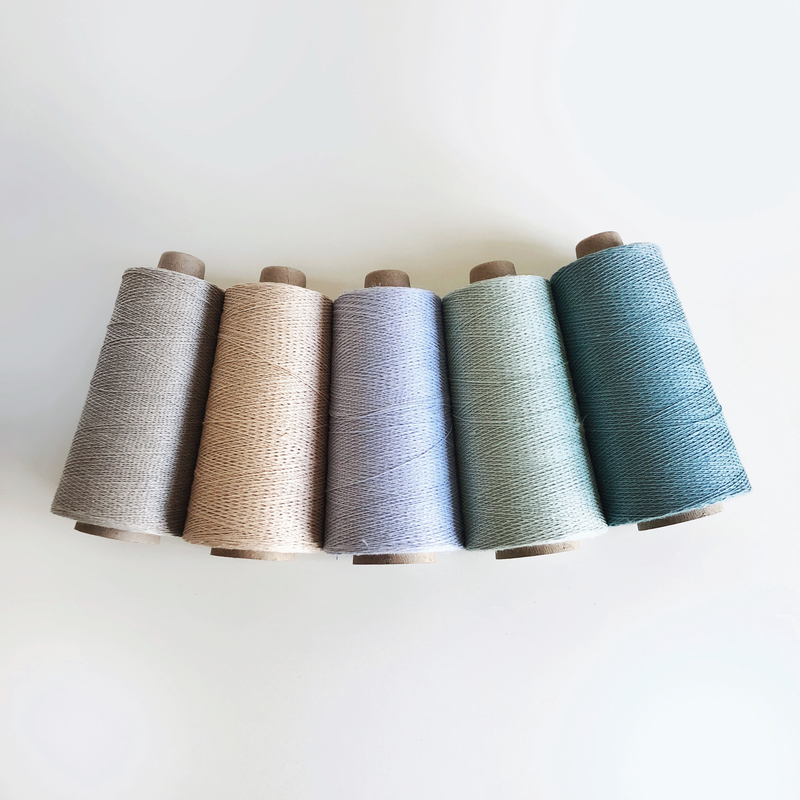 Weft color order: Get comfortable with the random! For these towels, I warped a few bobbins or pirns at a time with different colors, not entirely filling each of them so they had varying amounts of yarn on them. The great thing about these colors is that they all play so well together. So I just wove the piece with alternating blocks of color, not worrying about where one towel starts and the next stops. 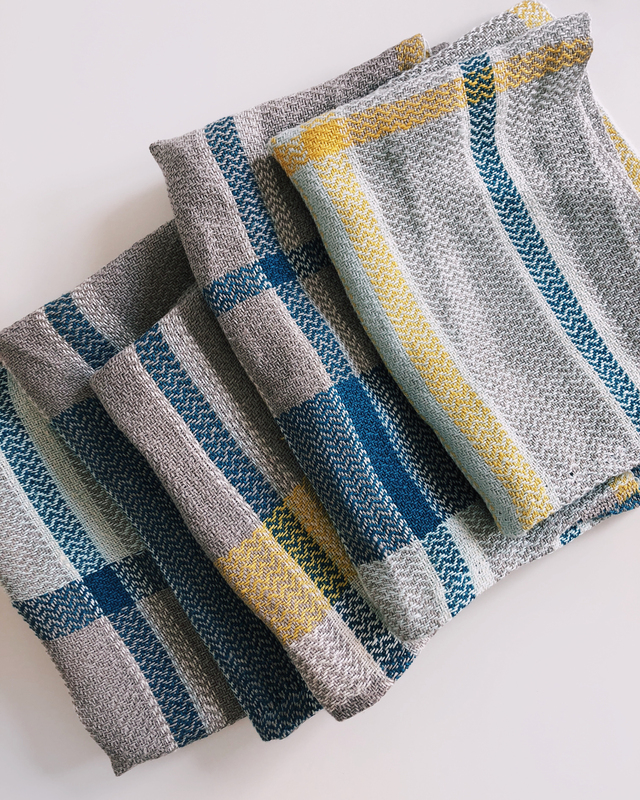 Each towel ends of being unique, but as a set they look lovely and coordinated together. Linen is one of those gorgeous, texture-y beautiful yarns that I get a lot of nervous questions about. Can I use it as a warp? Do I need to dampen it when I weave? Is it going to be hard? I'm probably a broken record because I have pretty much the same response about everything, but for this it certainly is true: Just try it! Linen doesn't have the elasticity of other yarn so it can be a tad more challenging as a warp, but it's nothing you can't handle. 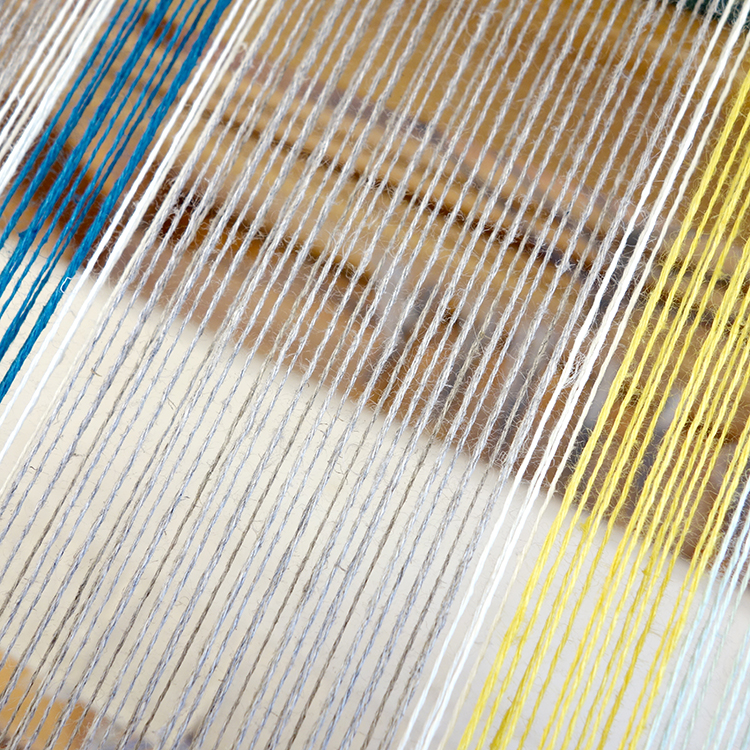 Take care to wind on with even tension, and as you are weaving, you should advance the warp frequently. Linen is very strong and won't break when you try to snap it, but it does weaken with side to side abrasion, so advancing your warp minimizes the time that any one part of the yarn is in the heddles. I’m also a newby working on a rigid heddle loom. 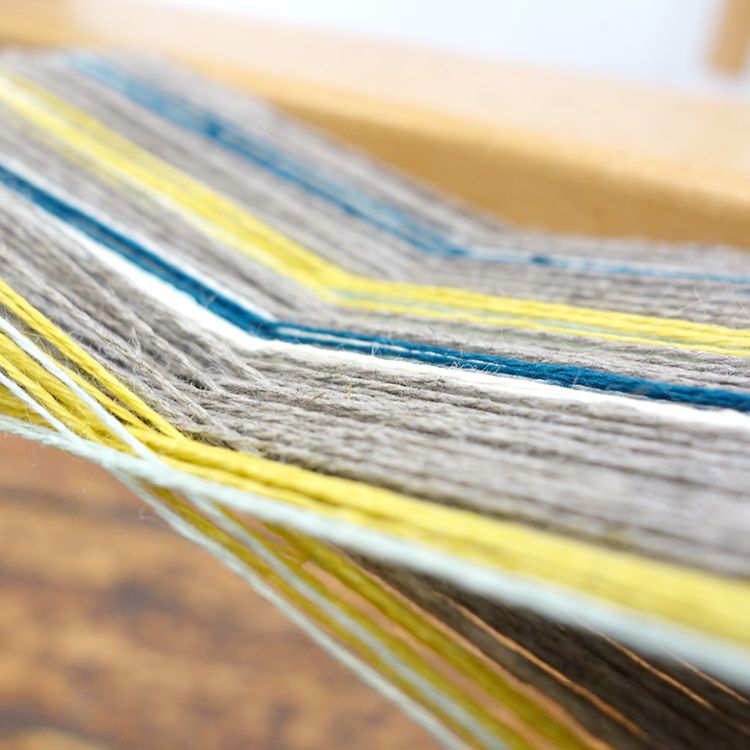 I would love some more advice on working with linen as it’s one of my favourite fibres. I’m experiencing issues with tension on the warp threads in the slots… would appreciate any advice or recommended resources for further study! I have to say that I didn’t know that weaving linen had a bad rap. I saw the beautiful linen I bought from Sara @ GIST and went for it! That’s as close to compliment as I could ever expect from him and I’ll take it! Thank you Sarah for this beautiful free pattern. I am also a pretty new weaver so I like when there is a kit already put together for me. Paula, I didn’t here, but you can! I’d add one floating selvedge to each side. 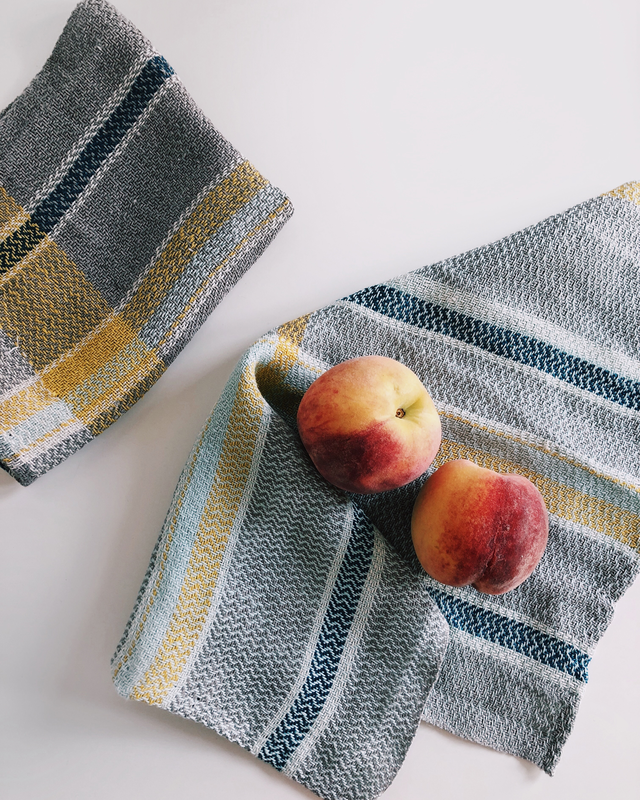 Sarah- weaving newbie here also… ;) I’m definitely trying one of these kits but have a question about the pattern~ do you recommend a floating selvedge for these towels? If so, how many ends? Thanks in advance! Hurrah Nancy! Perfect comment! My choice has been confirmed as well ! Sarah, I am so very new at weaving… actually trying to figure out which loom to buy, all the new terms to learn and if I really want to take this on or not. But, I love yarns and have worked with them all my life in one form or another. I found your site and subscribed because of your generous nature in sharing ‘how to ’ information and I thank you for taking the time to do so. In my mid 70’s, I come from a generation of ladies that were and are so very different from the younger generation of today. It always amazes me how mean spirited and hurtful people are becoming, saying anything they want to in order to hurt another person. I’m sorry for Sara ( whomever she is) to live within such a spirit…how awful it must be to see bad in everything rather than good. She must truly wake up each morning ready to find a fight of some sort. On the other side, how fortunate you are to have within you a forgiving , understanding nature. I have made three wonderful towels with the Italian Cotton linen on my 8 shaft loom and LOVE that yarn. I will be buying one of these kits as soon as I can make up my mind which color I like. I have lots of the other yarn left to make more towels with You have winenderful yarn. Loving the modern color palettes! It will be hard to decide. Dear Ms. vonTresckow(from whom I will never purchase anything), if you had bothered to read the whole blurb you would have noted Sarah’s statement that using a dryer shortens textile life. Thank you for the drafts & beautiful yarns! Well… I know who I won’t give business to. Much better to say simply “FYI, drying in the dryer will soften them up but will also shorten their life”. See? Much less catty and you’re passing on helpful info. Definitely uncalled for. And it took about 30 seconds online to figure out that Sara J von Tresckow is a competitor in selling linen yarns. Ouch, Sara. Not a great way to advertise your business. 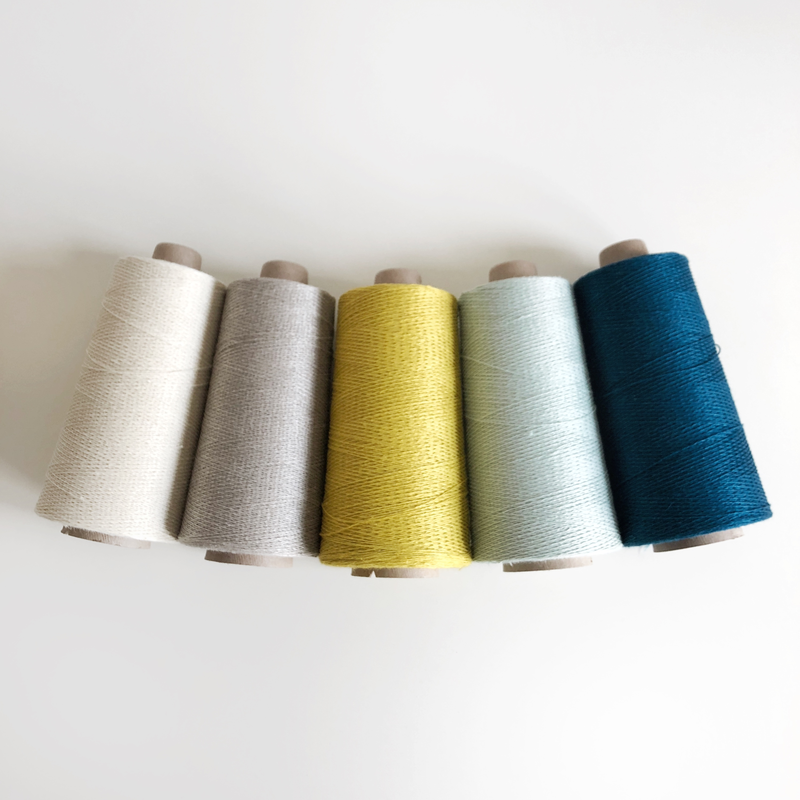 I’m interested in the Coastal linen kit but could I change out the yellow for a red? You are, hopefully, aware that putting pure linen towels in the dryer will significantly shorten their useful life. Or are you trying to up your sales?